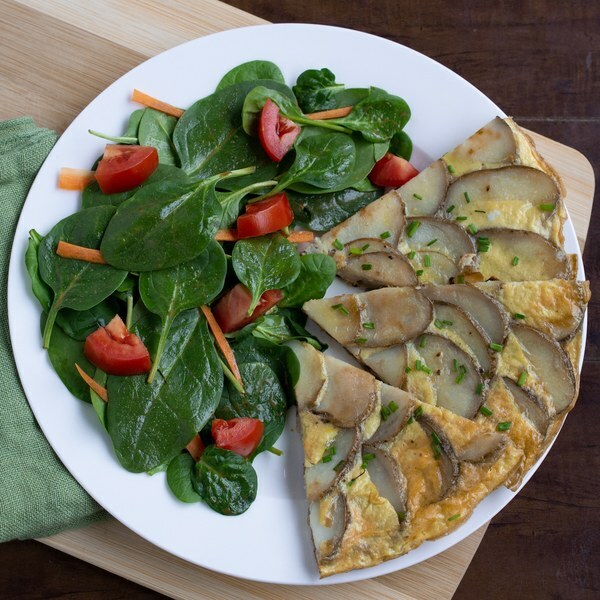 ← Spanish Potato & Onion Frittata with Spinach Salad . Using a mandoline or knife, slice the potatoes into very thin slices and transfer to a colander. Sprinkle with salt and toss to coat; set aside in the sink or on a plate to drain. Heat a non-stick skillet over medium high heat. Peel and thinly slice onion into half rings. Peel and mince (or press) the garlic. Once the skillet is hot, add olive oil and swirl to coat the bottom. Add onion, garlic, thyme, and oregano to the pan, stirring until soft and golden brown, 4-5 minutes; remove from skillet and set aside. Meanwhile, shake excess water from the potato slices and quickly pat dry with a paper towel. Add more oil and the potatoes to the pan; turn the heat down to low and cover with a lid. Cook potatoes, stirring occasionally, until tender, 5-7 minutes. Once cooked, spread onion in a layer on top of the potatoes. While the potatoes are cooking, crack the eggs into a medium bowl, add water and season with salt and pepper. Whisk to combine. Pour the egg mixture into the skillet gently so you don't disturb the potatoes. Cover with a lid and cook until the base and sides are set, about 5-6 minutes. Preheat oven to broil and position rack under the broiler. While frittata is cooking on the stove, combine balsamic, oil, honey, Dijon, salt, and pepper in a large bowl to make the dressing for the salad. Peel the carrots, then trim off the ends. Using a box grater, coarsely grate. Medium dice tomatoes and add both to the bowl with the dressing. Once frittata edges are set transfer the pan to the oven and broil until the centre eggs are firm and the top becomes golden brown, 5-7 minutes. Add spinach to the bowl with the dressing and toss to combine. Chop chives into small pieces. When frittata is done cooking, remove from oven and place a cutting board on top of the skillet. Using oven mitts, flip the pan to turn the frittata out onto the cutting board so that potatoes are facing up. To serve, cut frittata into wedges and divide between plates. Garnish with chives and serve with spinach salad. Enjoy!